Networking and cloud are critical enablers for business. We need the process of connecting an office computer across a high-performance network into mission critical compute, storage, applications and data in the cloud to be seamless and easy. But, can our service providers make this a reality? This year’s MEF17 Conference and Exposition in Orlando, Florida, November 13-16, 2017, showcased technologies that can ultimately enable the fulfillment of the vision MEF calls the Third Network - a network that is agile, assured and orchestrated. MEF is the same organization, formerly known as the Metro Ethernet Forum, that defined standards around Carrier Ethernet services – an $80 billion dollar market today. At the MEF17 event, MEF announced MEF 3.0, a transformational framework for defining, delivering and certifying new, dynamic and on-demand services – serviced based on the success of Carrier Ethernet work, but also bringing in lifecycle service orchestration (LSO) and multi-provider interaction models for a multitude of other services like optical, IP and cloud. Ciena used the event to show off its three new packet platforms that bring 100GbE closer to the network edge, as well as updates to its packet-switching platform. These enhancements enable service providers to cost-effectively expand and scale their Ethernet Business Service offerings up to 10GbE and 100GbE and drive new MEF 3.0 services. At the MEF17 event, MEF announced MEF 3.0, a transformational framework for defining, delivering and certifying new, dynamic and on-demand services. The conference featured a high-powered line-up of Service Provider speakers representing diverse views from around the globe. They talked about the emergence of new more agile, assured and orchestrated networks. Automation was a major theme. Operators are thinking about how to automate essentially everything. Coordinating the execution of automated tasks across different domains, in other words, orchestration is also seen as critical. Services need to integrate multiple domains (wide area network (WAN) and cloud), multiple technologies (software defined networking (SDN) and network function virtualization (NFV)), and multiple vendors. And while we are still in the early days of transformation, there is clearly significant progress being made towards getting to this new network. MEF and industry analysts were also impressed. Blue Planet was given awards for Excellence in Service Orchestration and Service Analytics. And, the AT&T, Colt, Orange, Ciena, Amdocs, Fujitsu demonstration was awarded the Third Network Proof of Concept Award for showcasing technology, innovation with MEF 3.0 and MEF Lifecycle Service Orchestration (LSO). 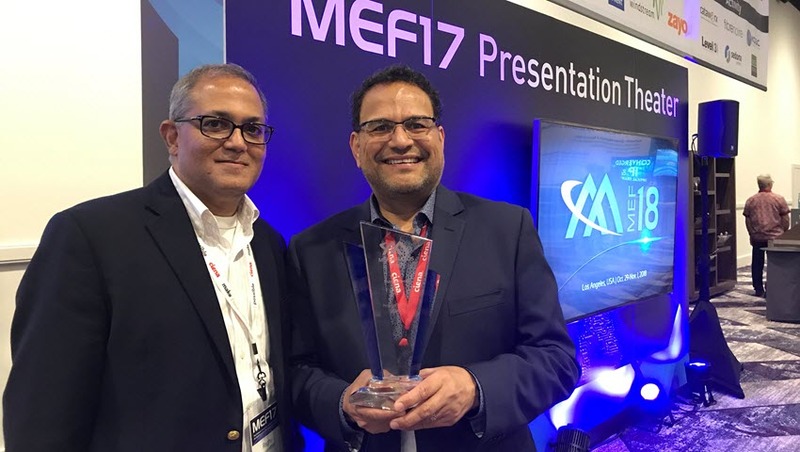 This was the second consecutive year Ciena was awarded a MEF Proof of Concept Award for Technology and Innovation. So, where do we go from here? As we heard Alexa respond when prompted to with an unrecognized command, “I’m sorry, my Ciena engineers haven’t trained me to do that yet.” I guess we’ll just have to stay tuned to see. Raghu Ranganathan and Marco Naveda, two members of Ciena's CTO office who were instrumental in the creation of the demonstration, holding the Proof of Concept Award for Technology and Innovation.